CC T 207 stabilizes tank residues. CC T 207 stabilizes tank residues that have a potential for re-suspension and spread of contamination during removal. CC T 207 transforms dry, powder-like tank residues to a spongy, “brownie-like” consistency. In many D&D projects, tank residue removal activities often require a low-tech “scoop it out” approach. This was necessary for the removal of dry residues from Tank 207, a 20 ft. high x 40 ft. high petroleum-size tank at the Rocky Flats Site. 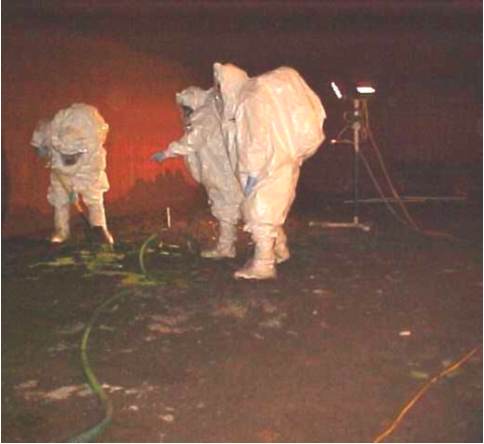 Transuranic (High Level Waste) residues were successfully stabilized and “scooped out” from Tank 207 after application of CC T 207 (see photo). CC 207 is pumped or poured into process tanks. It is packaged in both 5-gallon and 55-gallon containers.